With training camp just days away, our look at the 90-man roster is nearly complete. We’ve looked at the different positions on offense and most of the defense. So next up is the Patriots’ safety position. The team has been fortunate to have had no turnover in the safety position and return the top three players who are ostensibly starters in their own right. The team normally carries a few safeties as special teamers and this year will be no exception. Last season the team began with five safeties on the roster. So, with that in mind who is locked in and who is on the bubble? The team is in very good shape at safety to start the season as they have all three starters returning for 2018. McCourty is an excellent free safety and makes all the calls for the secondary as the quarterback back there. He’s a team captain and a leader, on and off the field. Not only is he always in the right position but he ensures everyone else is too on the field. He’s like having an extra coach on the field. He’s become a much more vocal presence on the field as one of the captains and is a leader on and off the field. Chung has been a totally different player in his second stint with the Patriots. The coaches play him close to the line of scrimmage in the box where he’s much more effective. He outstanding in run support, and like everyone else in the secondary, is a good tackler and is rarely out of position. He’s physical and does a pretty good job of covering backs out of the backfield and tight ends close to the line of scrimmage. He’s a solid locker room guy and seems to be a popular teammate while being another quiet leader. Harmon is essentially a starter with the number of snaps he plays and he has a tremendous nose for the football. A few of his big plays that come to mind are the interception to seal the deal against Baltimore in the playoffs and the one to close out the close win in Pittsburgh a year ago. Harmon allows the Patriots to move McCourty around in the big nickel defense. He’s always making big plays at key times and is a very trusted player on the defense. If McCourty were to miss any time with an injury, Harmon can be relied on to step in and do the job. Would he be able to make all the calls? That’s a question that we don’t know yet, but he’s another valuable piece of the defense. Ebner is coming off of a serious injury where he was placed on IR, however, he was re-signed to a two-year, $5 million dollar deal this spring, so he’s not going anywhere. He’s more of an STs ace than a safety, however. The Patriots signed UDFA safety Jones from Richmond last year and he has very good size for a strong safety at 6’3, 210 pounds to be a backup and eventual replacement for Pat Chung. He stuck on the practice squad last year, he saw almost 50 percent of the snaps in preseason and was a Patriots practice player of the week six times in 2017. Jones is athletic for a big man and returned kicks and punts in college and got some work in the return game last year. But he missed all of the spring with an unspecified injury so we’ll have to see if he’s healthy once camp begins. Richards continues to be unimpressive when he’s asked to play defense. After being a high draft pick (2nd Round, 64th overall) in the 2015 NFL Draft, he barely played defense in his first two years, and after a disastrous preseason in 2017, it was a surprise to not only see him make the roster but play significant snaps on defense. And the results were not good. He’s very stiff in his change of direction and takes horrible angles. Despite being a very solid locker room guy and very good on STs, his spot has to be tenuous after the showing he had in 2017. If Jones or Travis (below) can show the same STs ability, they could get the nod. The Patriots signed Travis as a UDFA and he’s an in-the-box safety. He has very good size at 6’2, 210 but he too is a bit stiff in his ability to change direction at the NFL level. He does a very good job against the run and is considered a high character player and person. He does, however, have excellent special teams’ ability. So it should be noted that Jones, Richards and Travis are essentially playing for one roster spot unless they decide to bring in another player. 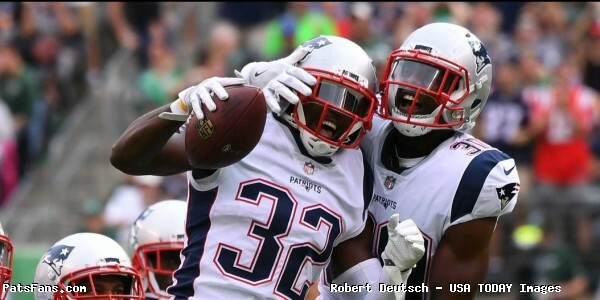 This entry was posted in 2018 Patriots Offseason, NFL Commentary, NFL News, Patriots Commentary, Patriots News and tagged 2018 Patriots preseason, 2018 Patriots Training Camp, 53 Man Roster Projection, Bill Belichick, Damarius Travis, David Jones, Devin McCourty, Duron Harmon, Jordan Richards, Nate Ebner, New England Patriots, NFL, Pat Chung, Patriots, Patriots safeties on July 23, 2018 by Steve Balestrieri. Even Super Bowl champions have their star struck moments. On Instagram Wednesday night, New England Patriots wide receiver Julian Edelman shared a photograph of himself and special teamer Nate Ebner with musician Justin Timberlake who was performing at Boston’s TD Garden. Timberlake has crossed paths with the Patriots on a few occasions over the years, performing the halftime show at two of their Super Bowl appearances. This entry was posted in 2018 Patriots Offseason and tagged Julian Edelman, Nate Ebner on April 6, 2018 by Robert Alvarez. 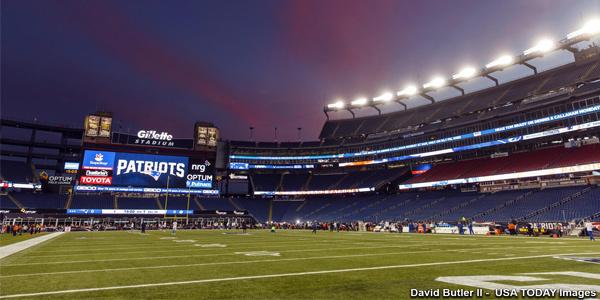 The Patriots are set at Safety with all three starters returning in Devin McCourty, Pat Chung and Duron Harmon. We say starting because all three play enough snaps to be considered starters. But in August both McCourty and Chung will turn 31(13th and 19th respectively) and it isn’t too soon for the Patriots to begin looking for possible prospects as replacements. Alabama is a place where Bill Belichick’s buddy Nick Saban cranks out NFL ready players, especially on their defense. In recent years the Crimson Tide has produced Eddie Jackson, Clinton Ha-Ha Dix, and Landon Collins to make their mark on the Pros. This season’s crop has two that should be gone off the draft boards by the 2nd round. The Patriots have a thing about selecting safeties early in the draft and with Harmon facing possible discipline from the league over a recent incident in Costa Rica, they could be in the market again. Although they have three other safeties in Nate Ebner, Brandon King, and Jordan Richards, Ebner and King are special teamers and Richards has filled in at safety but not very well (see Super Bowl LII). David Jones is on the practice squad. 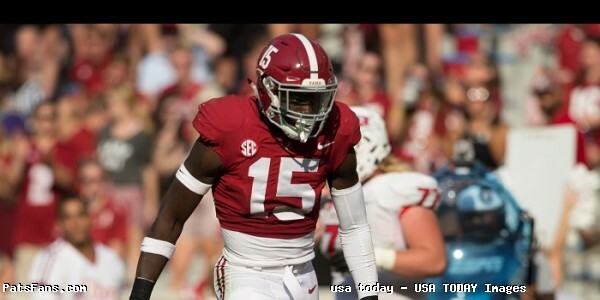 Ronnie Harrison from Alabama is another excellent safety from the Crimson Tide program. He possesses great size (6’3, 216) and speed. Harrison was a high school quarterback, so he understands well what the offense is trying to do. He is versatile and has played both safety spots but he’s a better fit as the strong safety in the box due to his issues with the changing of direction and range. But as an overall safety? There are few better in the country. He has plenty of physicality, athleticism and good instincts to be an impact player on Day 1. Bama moved him around but he was at his best when they had him attacking the line of scrimmage. He does a great job of recognizing plays and attacking downhill. He’s outstanding in run support, filling the holes quickly and a violent, punishing hitter in the trenches. He led the team with 74 tackles, (43 solos) and seven passes defensed with three interceptions. Harrison has the size, speed and physicality to play the linebacker role in the Patriots “Big Nickel” defense as well as their in the box safety. Harrison could immediately vie for reps and let the coaches see what he can do. They’ll spell Chung and McCourty for a bit and let the rookie get his feet wet in the NFL. As we mentioned above, he could be used as the linebacker in the Patriots “big nickel” look on defense. Yes, in Year 2 with a bit of experience, he could push Chung for his roster spot. Or perhaps Harmon. Harrison isn’t without a few issues that will need to be cleaned up. He doesn’t have great range or change of direction which could limit his use as a single high safety. He sometimes goes too much for the big hit and doesn’t wrap up which can result in a big play or broken tackle. But as a strong safety in the box, he’s outstanding in run support and he’ll be just fine covering tight ends close to the line. He could easily gain another 5-10 pounds without any loss of speed and be the hybrid safety/linebacker the Patriots like to use in their big nickel packages. His physicality, and instincts are off the charts. By Year 2, he’ll be not only pushing for starter reps but could become an impact player on the defense. While safety isn’t a position of need right now, the Patriots could find themselves in a dilemma. If Harrison is on the board, the team could be hard-pressed to pass him up. He is a potential Pro Bowler and will be a very solid player at the next level. Zierlein compared him to a young Adrian Wilson and that may be the best description of him yet. 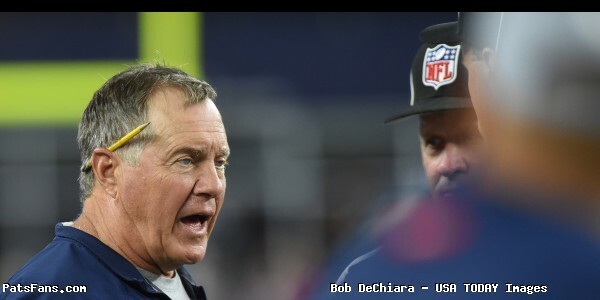 This entry was posted in 2018 Patriots Offseason, NFL Commentary, NFL News, Patriots Commentary, Patriots News, Patriots Rumors and tagged 2018 NFL Draft, 2018 Patriots offseason, Bill Belichick, Brandon King, Devin McCourty, Duron Harmon, Jordan Richards, Nate Ebner, New England Patriots, NFL, Pat Chung, Patriots, Patriots safeties, Ronnie Harrison on April 2, 2018 by Steve Balestrieri. The New England Patriots made their first official signing of 2018 Free Agency on Tuesday, bringing back safety and special teamer Nate Ebner on a two-year contract worth 5 million with $1.2 guaranteed. He can make $2.8 million in 2018 and $2.2 million in 2019 per the Boston Globe’s Ben Volin. 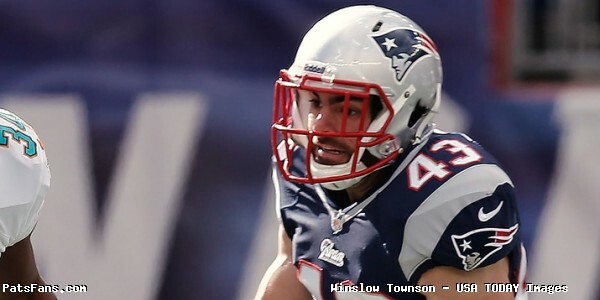 Ebner, a Patriot for his entire NFL career dating back to being drafted in the sixth round in 2012, had his 2017 season cut short in Week 12 following an ACL tear while recovering a fake punt. Despite the 2017 setback, Ebner has been a reliable member to the teams special teams unit in his six seasons and has been viewed highly by head coach Bill Belichick. On Instagram Wednesday, Ebner shared his excitement towards the new contract. This entry was posted in NFL News, Patriots News and tagged 2018 Free Agency, Nate Ebner on March 14, 2018 by Robert Alvarez. 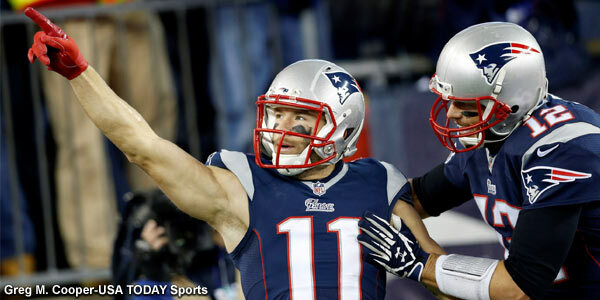 VIDEO: Julian Edelman Celebrates Hanukkah With Teammates. Patriots wide receiver Julian Edelman celebrated the first day of Hanukkah with Danny Amendola Tuesday night, and shared it in a social media posting on Twitter and Instagram. Both wearing yarmulkes, Amendola joined Edelman for the traditional lighting of the menorah. The video also featured a reading of the first candle blessing. Hanukkah began Dec. 12 and ends Dec. 20 this year on the Jewish calendar, from everyone at PatsFans, have a wonderful holiday to those in Patriots Nation celebrating. On night three, Edelman gathered with Nate Ebner, Ryan Allen and Patrick Chung. This entry was posted in Patriots Commentary, Patriots Video and tagged Danny Amendola, Julian Edelman, Nate Ebner, Patrick Chung, Ryan Allen on December 16, 2017 by Robert Alvarez.